Wedding photography in Mendocino County and Northern California. Prices available online. Located in the Mendocino, California, we manufacture exclusive signs for unique projects. Provides residential mortgage financing in the state of California. Architectural services, including structural engineering, project management, construction administration, building inspections, facilities planning, and litigation support. Offices in Mendocino and Sebastopol. Makers of chocolate truffles, nuts and chews, and specialty chocolates, available in redwood boxes with logos. Stores in Mendocino and Fort Bragg. Makers of chocolate truffles, nuts and chews, and specialty chocolates, available in redwood boxes with logos. Stores in Mendocino and Fort Bragg, and online sales. Photographs of Mendocino County, California, wildflowers and landscapes for purchase as archival glossy or inkjet prints and an introduction to his book 'A Journey In Time: Mendocino County Wildflowers'. Offers Pots, Slabs, Displays and trees. Cookie gift baskets and tins with over a dozen varieties. Handcrafted leather bags, belts, and head bands from the Mendocino coast. Specializes in own-root Old Garden Roses. Mendocino. Carla J. Stange. Resources and information about homebirths, water birthing, family products, birth stories, and book reviews. Breeders also offering training services. Standing A Music Tradition. Located in Mendocino. 26 Anchor Bay Campground Mendocino County. Mendocino County. RV and tent sites on the beach. Complete descriptions, photos, easy to navigate. 27 Mendocino Midwife Carla J.
Carla J. Stange. Resources and information about homebirths, water birthing, family products, birth stories, and book reviews. Annual tasting event held in June in Mendocino County. Includes a list of participating wineries, a map, and contact information. Winery producing Chardonnay, Cabernet Sauvignon, and a red blend from Mendocino County. Contains product descriptions, recipes, and an article on health effects. Santa Rosa producer of Chardonnay, Cabernet Sauvignon, and a red blend from Mendocino County. Contains product descriptions, recipes, and an article on health effects. Organization of vineyards and wineries offers information about its members. Also includes event listings as well as regional facts and historical information. Winery producing a range of red and white wines. Includes product descriptions, ordering, tasting notes [PDF format], and a company overview. Day tours of the Napa, Sonoma, and Mendocino regions. Includes tour descriptions and a company profile. Also offers tasting classes and a personal shopping service. Day tours of Californias Napa, Sonoma, and Mendocino regions. Includes tour descriptions and a company profile. Also offers tasting classes and a personal shopping service. Treeing Walker Coonhound breeder, also dogs and equipment for sale. Walkers, Plotts, Black & Tans, Redbones, Blueticks and English hounds.Photo gallery, club listings and breed information. Winery producing Muscat, Pinot Blanc, Pinot Noir, and Petite Sirah from organically grown grapes. Includes product descriptions, online ordering, and a company overview. Redwood Valley producer of Muscat, Pinot Blanc, Pinot Noir, and Petite Sirah from organically grown grapes. Includes product descriptions, online ordering, and a company overview. Offer guided sea kayak eco-tours in Trinidad Bay and the Mendocino sea caves with no experience needed. Also offers kayaking lessons. Site includes a schedule of events, wildlife updates, current conditions, and photography from trips. Week-long world music and dance celebration with workshops and performances. Held at Mendocino Woodlands State Park in California. Includes maps, photos, list of instructors, site and program details, and registration form. Private resort and country club near Napa and Mendocino in Sonoma County. Hole descriptions, layout, public access and membership information is listed. Account of a disabled gay man is falsely accused, arrested, and has his home searched. He fights back in federal court and wins. Information about an approved measure that banned the growing of genetically altered crops and animals. victorian inn and restaurant in mendocino. includes photographs and a downloadable wedding services brochure. serves sonona, marin, napa and southern mendocino counties. includes services, fees, and feedback option. open to the general public. includes legal forms, legal self-help, references, and homework helpers. Information about an approved measure in a California county that banned the growing of genetically altered crops and animals. fort bragg-based firm serving mendocino and the northern california coast. includes owner biography, vendor links, and information on vow renewals, weddings, and other occasions. mendocino, ca attorney, providing legal assistance in areas including student discipline and compliance with special education and disability acts on behalf of public schools and students. mendocino gallery exhibiting artist, craftsmen, and wood-workers from mendocino county and the united states. association of furniture makers dedicated to the preservation and evolution of fine furniture building. includes galleries and schedule of displays. ecologically sound lumber specializing in 100% old growth redwood and clear all heart air seasoned timbers, all harvested prior to 1930.
collective of craftsmen, woodworkers, builders, designers and purveyors of fine woodworking. lists craftsmen according to specialty. eco-salvaged first-growth redwood from mendocino, california. cants, timbers, and lumber. rare curly grain in stock as well. Workshops for writers of all genres. Meet literary agents and publishers, participate in a variety of intensive workshops, one-on-one conferences with writers and agents. SiteBook Mendocino City Portrait of Mendocino in California. 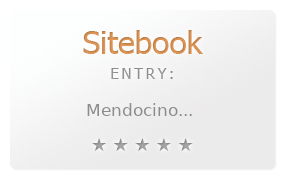 This Topic site Mendocino got a rating of 3 SiteBook.org Points according to the views of this profile site.